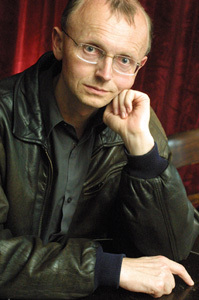 Dieter Gräf was born in 1960 in Ludwigshafen and now lives in Cologne. His first book of poetry, Rauschstudie: Vater + Sohn was published in 1994, and he followed that with two other successful volmes, Treibender Kopf of 1997 and Westrand of 2002. He edited an anthology of poetry, Das luechtrende Buch. Die Welt als Wunder im Gedict in 2004. Gräf has also participated in multimedia collaborations, including the installation with Margret Eicher, Tussirecherche (Tussi Research). He has received the Leonce and Lena Prize from the city of Darmstadt in 1997 and held fellowships at the Literarisches Colloquium in Berlin (1966), the Villa Aurora in Los Angeles (1999), and Villa Massimo in Rome (2004). His poetry explores issues of mythmaking, from myths of everyday life to those of ancient history as in the story of Gilgamesh. He was had two books of poetry published in English from Green Integer, Tousled Beauty (2005) and Tussi Research (2007), and his poetry was included in the 2006 anthology, The PIP Anthology of World Poetry of the 20th Century, Volume 7: At Villa Aurora—Nine Contemporary Poets Writing in German, edited by Douglas Messerli. able. Rings around the planet, polished. Reprinted from Tousled Beauty (Los Angeles: Green Integer, 2005). English language translation ©2005 by Andrew Shields. Reprinted by permission of Green Integer.